For the fifth year in a row Game of Thrones has taken the crown for the most pirated TV-show on the Internet. The Walking Dead remains in second place, with newcomer Westworld right behind. For several years in a row Game of Thrones has been the most pirated TV-show, and this year the interest is once again overwhelming. Game of Thrones has the honor of becoming the most-downloaded TV show through BitTorrent for the fifth year in a row. This means that its half-decade reign remains unchallenged, despite reports to the contrary. Although there was no new swarm record, traffic-wise the interest was roughly on par with last year. 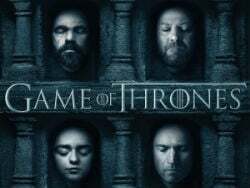 The highest number of people actively sharing an episode across several torrents was 350,000 at its peak, this was right after the season finale came online. This doesn’t necessarily mean that there’s no growth in piracy. A lot of people have made the switch from torrents to streaming sites over the past months, which likely had an impact on the numbers. This year there’s also an important newcomer with the science-fiction western ‘Westworld.’ The new show quickly gained popularity in pirate circles and is in third spot already, which is quite an achievement. Finally, we see a continuation of the trend of downloaders showing an increased interest in high-quality video. In recent years, many pirates have moved from 480p copies to 720p and 1080p videos, in part thanks to better broadband availability. Below we have compiled a list of the most torrented TV-shows worldwide (single episode) for 2016, together with the traditional ratings in the US. The ranking is compiled by TorrentFreak based on several sources, including statistics reported by public BitTorrent trackers. We have decided to stop reporting download estimates in our yearly top lists. Due to various changes in the torrent index/tracker landscape it’s become more challenging to monitor downloads, so a ranked overview makes most sense.